French brand Filorga is famous for launching prestigious face cosmetics. It’s a brand that takes advantage of experience and achievements of aesthetic medicine. 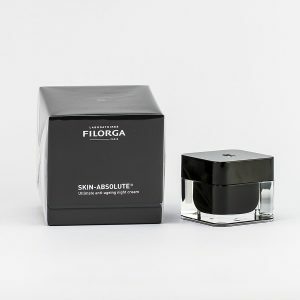 Filorga cosmetics are appreciated even by the most demanding people who expect a cosmetic to deliver profound effects. All Filorga preparations have nourishing, rebuilding and rejuvenating action. What’s more, this French brand products improve skin density. These cosmetics are incredibly effective and frequently surprise with the ingredients that are used into their compositions. One of the most prestigious products of Skin-Absolute® is Night Cream with meteorite extract. Indeed, it’s an exceptional product that can’t be compared with any other face cream. When it comes to meteorite extract used in the cosmetic, this ingredient is picked up from Sahara’s terrains. The producer ensures that this intergalactic component activates youth genes like no other substance. Just a few weeks are enough for skin to win youthful density and shine, to become firm and amaze others with its healthy look. Furthermore, the cream is wonderful at shallowing wrinkles and reducing discolorations that develop on skin with age. brown seaweed extract – transports nourishing substances to skin cells, rebuilds skin and has strong anti-inflammatory action. snake venom extract – it’s a lifting complex that shows anti-wrinkle action; it firms skin well. designed in the brand’s laboratories NCTF complex of anti-oxygenating action; it’s one of the building blocks of human tissues. It stimulates production and renewal of skin cells. vitamin C – it’s the vitamin of youth. It’s one of the most active anti-oxygenating ingredients. It’s responsible for delivering shine to skin and intensifying complexion colour. Moreover, this substance slows down wrinkle development since it influences collagen production. oat bran extract – contributes to epidermis regeneration and balances sebum production. Phytic acid, which is present in the oat bran, is able to highlight skin. hyaluronic acid – an organic substance of strong rejuvenating and anti-wrinkle action. It’s responsible for maintaining right level of moisture in skin and is good at firming. The cream is designed for mature skin. It’ll work as an iron for wrinkles, even the clearly visible ones. Due to regular application, Skin-Absolute® Night Cream with meteorite extract enables skin to restore its young appearance. Face starts looking as well-rested and is nourished. The cream contributes to improving processes that take place in skin. Skin-Absolute® Night Cream with meteorite extract has to be applied every evening after precise face and neck cleansing. Many women compare the face cream to iconic La Mer. However, you have to give a try to Skin-Absolute® Night Cream with meteorite extract to learn is spectacular and definitely out-of-this-world action.